Another with the blue green theme. My screensaver is a slide show of random photos from taken over the last years (gazillions of them, I'm sure you can relate). Every time a simple patchwork quilt comes on the screen I promise myself I'll put making one at the top of the list. So I did. And here's the first. Yes, first, because one just wasn't enough ... so, more to come. 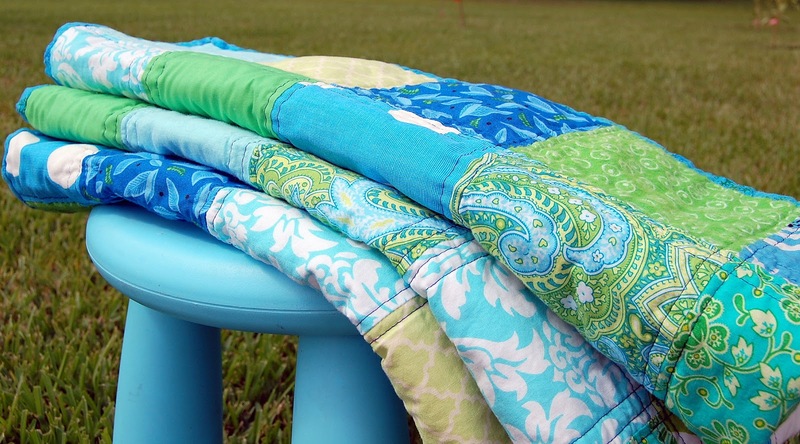 A collection of yummy blues and greens. 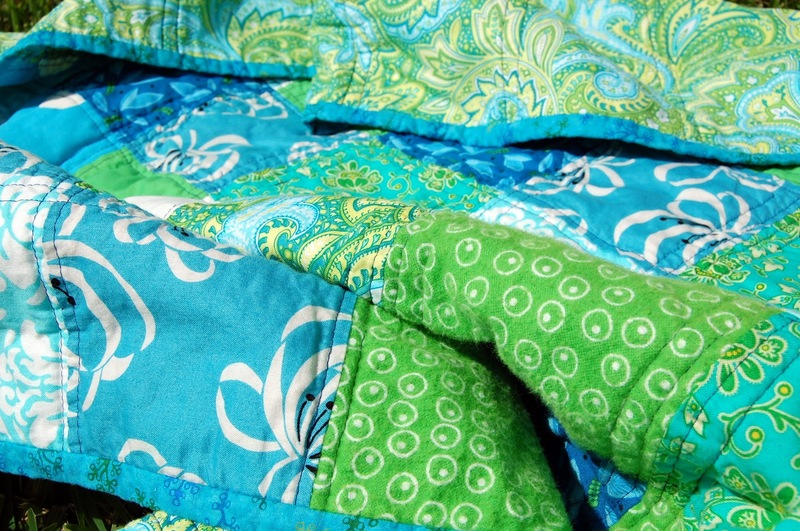 Many of the fabrics were used in this quilt, but I went more aqua/teal with this one. It's always fun to see what a difference a slight color change can make. 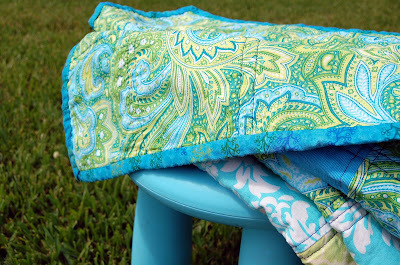 The back of this beauty is blue/green paisley, a fabric I absolutely love and have purchased many times. It's from JoAnn's and they have more, and JoAnn's happens to be next to Target, where I have to go. Coincidence? Perhaps. The binding is an awesome blue with green and blue leafy things (some sort of leafy plant branch type thing ... great for BOYS) on it. Another great find from JoAnn's. I love finding a fabric with good color that isn't floral. I quilted this with royal blue straight lines. 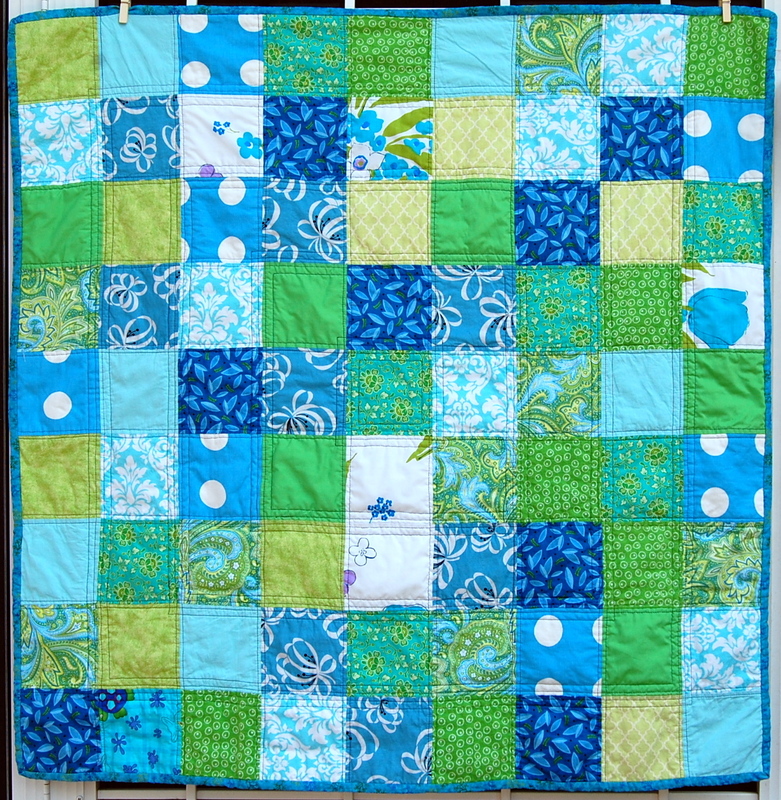 That was fine, but just didn't feel like enough when the quilt was done so I added more lines. And then it felt just right, so I'm very happy with that decision. I had no idea that we had another home schooling, quilting Momma on here! Nice to meet you & I read in a older post that you vacation in our state! :) Fun! Wonder what area? A question...& maybe I missed it..."what size squares do you do these in"? 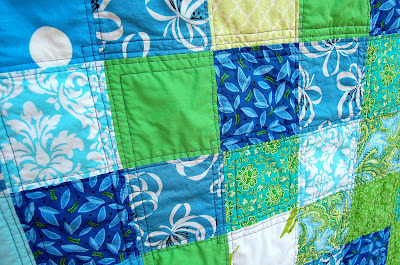 This quilt?